Signal transduction by prokaryotes almost exclusively relies on two-component systems for sensing and responding to (extracellular) signals. 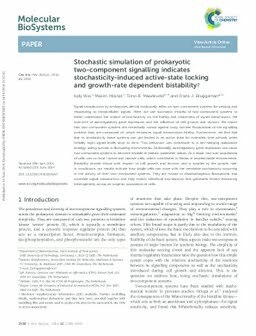 Here, we use stochastic models of two-component systems to better understand the impact of stochasticity on the fidelity and robustness of signal transmission, the outcome of autoregulatory gene expression and the influence of cell growth and division. We report that two-component systems are remarkably robust against copy number fluctuations of the signalling proteins they are composed of, which enhances signal transmission fidelity. Furthermore, we find that due to stochasticity these systems can get locked in an active state for extended time periods when (initially high) signal levels drop to zero. This behaviour can contribute to a bet-hedging adaptation strategy, aiding survival in fluctuating environments. Additionally, autoregulatory gene expression can cause two-component systems to become bistable at realistic parameter values. As a result, two sub-populations of cells can co-exist—active and inactive cells, which contributes to fitness in unpredictable environments. Bistability also proved robust with respect to cell growth and division, and is tunable by the growth rate. In conclusion, our results indicate how single cells can cope with the inevitable stochasticity occurring in the activity of their two-component systems. They are robust to disadvantageous fluctuations that scramble signal transduction and they exploit beneficial stochasticity that generates fitness-enhancing heterogeneity across an isogenic population of cells.